The teaching schedule, interests, and resources of a Buddhist nun, teacher and activist. Venerable Tenzin Chogkyi is a Buddhist nun, activist and teacher of both Buddhist and secular programs. She loves bridging the worlds of Buddhist thought, current events, and the latest research in the field of positive psychology. As well as being passionate about her spiritual practice, she also cares deeply about prison reform, animal rights, social justice and bringing an end to systemic forms of oppression. Venerable Tenzin first became interested in meditation after reading Be Here Now and Autobiography of a Yogi in the early 1970s. She describes her spiritual path over the next 20 years as “meandering and haphazard” until she bought a one-way ticket to India in early 1991 with the intention of meeting His Holiness the Dalai Lama. In the end, she became a student not only of His Holiness, but also of Kirti Tsenshab Rinpoche and Lama Zopa Rinpoche during the year she spent studying at Tushita Meditation Centre in Dharamsala, India and Kopan Monastery in Kathmandu, Nepal. Venerable Tenzin took preliminary ordination vows with Lama Zopa Rinpoche in 2003 and novice ordination in 2004 with His Holiness the Dalai Lama. 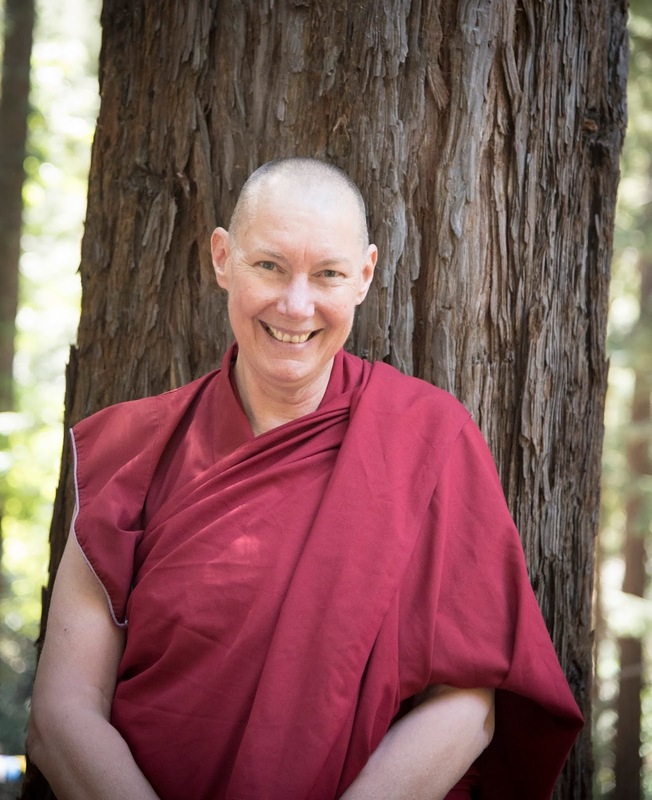 Since 2006 she has been teaching at various FPMT centers around the world, in North and South America, India, Nepal, Australia, and New Zealand. She has been the resident teacher of Mahamudra Centre in New Zealand, Gendun Drubpa Buddhist Centre in central British Columbia and Vajrapani Institute in California. She is also a visiting teacher for the Liberation Prison Project and has taught in prisons in the US, Colombia, Australia, and New Zealand. Venerable Tenzin is authorized by the FPMT to teach at both the foundational and in-depth levels, and to lead long retreats. In November 2018, she completed the teacher certification for Compassion Cultivation Training, a secular compassion training program developed by Geshe Thubten Jinpa and colleagues at Stanford University. In addition, she has been teaching the Cultivating Emotional Balance program since 2013. This is a secular program using contemplative techniques drawn from Buddhism for managing emotions, developed by Alan Wallace and Paul Ekman at His Holiness the Dalai Lama’s request. She is also a teacher of the a.r.t. of Fulfillment, one of the secular programs of the Foundation for Developing Compassion and Wisdom. She is an adjunct faculty member of John F. Kennedy University and in December 2018, she taught a course entitled "Engaged Buddhism and Social Change" for the College of Psychology at the San Jose campus. She loves interfaith collaboration and is a volunteer for the Interfaith Speakers Bureau of the Islamic Networks Group in the greater San Francisco Bay Area. 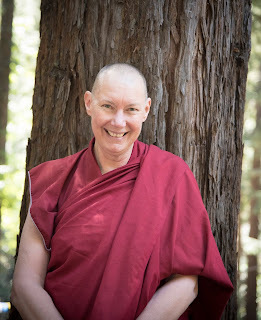 Since August 2018, she has been based at Land of Medicine Buddha in Soquel, California, a beautiful center in the redwood forest close to the Monterey Bay where she teaches in the local community, continues her prison work and her engagement in social justice activism.